The Waking Land by Callie Bates. Del Rey Books, 2017. Hardcover. 400 pages. This is another hard one to review. I was already looking forward to this one, and then I saw Robin Hobb's (author of The Farseer trilogy) five-star review and my excitement shot up even more. After reading it, however, I'm left feeling very unsure. On the whole, this is a solid, entertaining fantasy that I really enjoyed. But despite that... it was still a rather average book. I don't mean that in a distinctly negative sense, but more in the sense that I had certain expectations of this book that weren't met -- it is still a good book overall, just not what I thought. Parts of this book really stood out and seemed unique, but there were just as many overly predictable plot points as well. This book was brimming with potential and an overabundance of fantastic magical ideas, but there were so many places that just fell flat and left me wishing for more, which disappointed me. The characters were really a mixed bag. I loved some of them, like Alistair and Jahan, but others were just... meh. Elanna was also hit and miss. She had many moments of seeming rather annoying and repetitive, but I did also really appreciate her moments of strength and forcefulness when she would realize that she just needed to buck up and make a decision or follow her gut, even if it didn't seem right. I was also a bit annoyed by how wishy-washy she seemed regarding her loyalties, but then I considered her position of having to choose between the place where was raised and is loyal to and a place where she is actually from and where her biological family is, and I actually understood what a difficult position that would be. So props to Elanna for struggling through such a weird situation. Alistair, whom I mentioned above, isn't necessarily a 'main' character, but is someone I considered a main secondary character, and he really helped bring life to every scene he was in. I loved his loyalty, his strength, and down-to-earth nature that made him such a fascinating person to follow. Jahan, the love interest of Elanna, was also someone that I really enjoyed reading. Was some of his personality a little bit cliche'd? Yes. Was the romance a little odd and unnecessary? Yes. I can't deny either of those things, but despite them, I still really loved every scene he was in - he shined and brought so much life to the story. The main thing that I really loved about this book was the magic system. I love magic that is tied to the earth, and this was an amazing take on that notion. I loved how Elanna could control the land around her and make things grow and whatnot, but I wanted so much more! Her process from not really knowing how to use her powers to using them to save her land was far too quick for my liking and understanding. I wanted to know more about how she actually used her power and learned to master it, and I feel like we just didn't quite get enough. Now, the romance: I liked it in general, but it was too fast. I completely understand that lust you get when you first meet someone that is so strong and it feels like you're in love - but you're not! You might fall in love one day, but it's not immediate -- it takes a while, so don't rush ahead and make things weird. If there had been just a little bit more time between the characters, it would have been just fine. The writing is nothing spectacular, but it is certainly well-done and enjoyable. The world-building was also okay. I felt a little confused about locations, but in the end it worked. The history in this world is a bit confusing at times, and many things are thrown around. 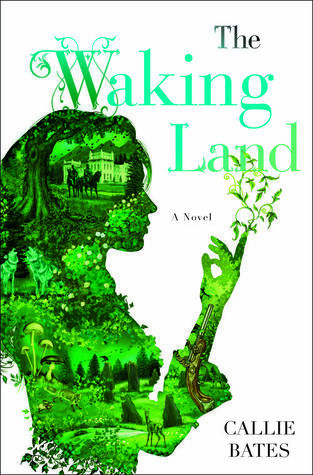 Overall, I am giving The Waking Land 3.75 stars! I had to get into the nitty-gritty here because it didn't quite reach four stars but it was absolutely above three. Hence, 3.75. I recommend this to anyone who loves an entertaining fantasy with some entertaining dialogue, complex political issues, and a great magic system. I won a copy of this and I hadn't actually heard ANYTHING about it till now. 😜 So I'm excited to read your review! Sadness it kind of flopped a bit with missed potential (ugh I hate that in books honestly...it's frustrating) but I'm glad the magic system was great and eeeep I'm aaall for good dialogue! THAT is the struggle with a few Fantasy books nowadays, all brimming with potential but falling a bit flat, especially when a few things don't get the time they deserve (like the mc learning her magic!). However, it still sounds like a nice read and I wouldn't mind picking it up! The cover is so pretty and it goes with the main character's power. Great review, Jordan!